Today I spoke with a customer. They had been a little confused about Polythene covers. They had seen both a 720 gauge and 800 gauge polythene sheets. At a glance both look identical. Which prompted the question, what are the differences? There is a lot of options with polythene sheets which can cause confusion. However we recommend for most customers growing a variety of vegetables (or bedding plants and flowers) 800 gauge (200 micron) clear polythene. Most 800 gauge polythene covers give high light transmission which is most important in this country. It also is important that the polythene is ‘thermic’ meaning it is good at reducing heat loss on cold nights. You should always check with your supplier that there polythene has these features. While most of our customers grow organically we need to point out to those who use chemicals that their use around the polytunnels can affect the life of the cover. 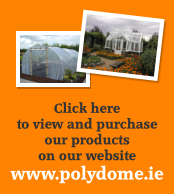 At Polydome we give our film a 6 season warranty against UV degradation although it can last longer depending on the amount of sunlight it receives during its lifetime and the laying conditions during installation. A cover tensioning system in our Polydomes Tunnels helps to prolong the cover’s life. Being 800 gauge it is tougher than lighter films which helps protect it in storms and gives longer life than lighter films.